The New Source Nail XL Sig2 VapePen Kit is a superior portable eNail and VapePen for vaporizing waxy oil concentrates with over 30 compatible atomizers and a powerful variable temperature control battery ranging from 200 to 700 degrees Fahrenheit. The accuracy or the new variable voltage battery provided in the Source Nail XL Sig2 Kit allows you to easily dial in the perfect temperature to vaporize unlocking the healing powers from your waxy concentrates while preserving the essence and flavors making for a most enjoyable session. The portable eNail if compatible with a number of Source Vapes atomizers from the 3, 4, and XL Series. Create and enjoy portable dabs using the incredible rig which heats in clouds only 7 seconds. 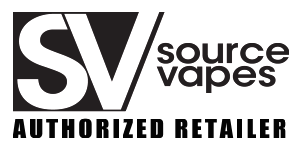 Source Vapes backs this product with a hassle-free lifetime warranty which certifies their commitment to quality. PREMIUM NAILS The Source Nail XL Sig2 Vaporizer Kit includes 6 high grade nails crafted of medical-grade quartz, titanium, and ceramic. Each nail provides a unique way to vaporize the waxy oil concentrates. The device includes dab nail and quartz carb cap. Simply dab a drop concentrate onto the atomizer and the Nail will vape huge, flavorful clouds. This vaporizer is compatible with over 30 Source Vapes to create a unique a tailored experience atomizers. HIGH GRADE GLASS ATTACHMENTS The Source Nail XL Sig2 vaporizer includes two high grade glass attachments. To dab, you can use the one-piece bubbler or the device as a portable VapePen with the included Source Nail Glass Globe. The bubbler cools and moistens the vapor for smooth hits. The glass globe allows the hits more time to cool and preserves the flavors. The Source Nail XL Sig2 and all compatible attachments are 510-threaded and all crafted with medical-grade materials. PRECISION TEMP CONTROL Equipped with precision temperature control, the new Source Nail XL Sig2 eNail and VapePen provides the ability to choose the exact degree for the optimal experience when dabbing your concentrates. Dial in the perfect temperature for various concentrate consistencies between from 200F to 700F. The wide temperature range allows you to change from intensely flavored sips to intensely large dabs. Once the temperature is selected the Source Nail XL Sig2 will heat in 7 seconds. 20% OFF WITH CODE "SOURCENAIL2"